We’ve just added to our range of Indian recycled furniture with sideboards, media units and bedside cabinets. These are all solid timber (mainly teak) reclaimed from doors, boats etc. with some of the original paint left on to give them a very stylish and contemporary look. Each piece is totally unique in colour and look. They are more a work of art than an item of furniture but of course are totally usable with a selection of doors, drawers and shelves. We were able to get these pieces at a reduced rate so can pass on the saving to our customers resulting in our prices being dramatically lower than the recommended retail prices. 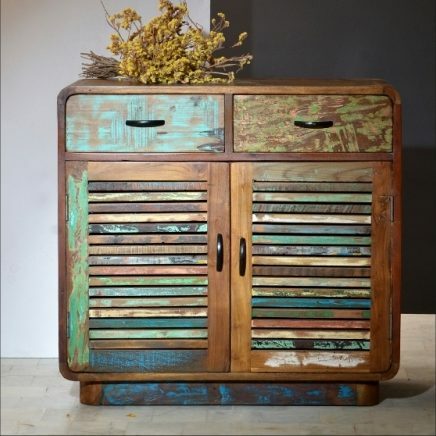 Here’s a link to the Reclaimed Shutter Sideboard – click here.